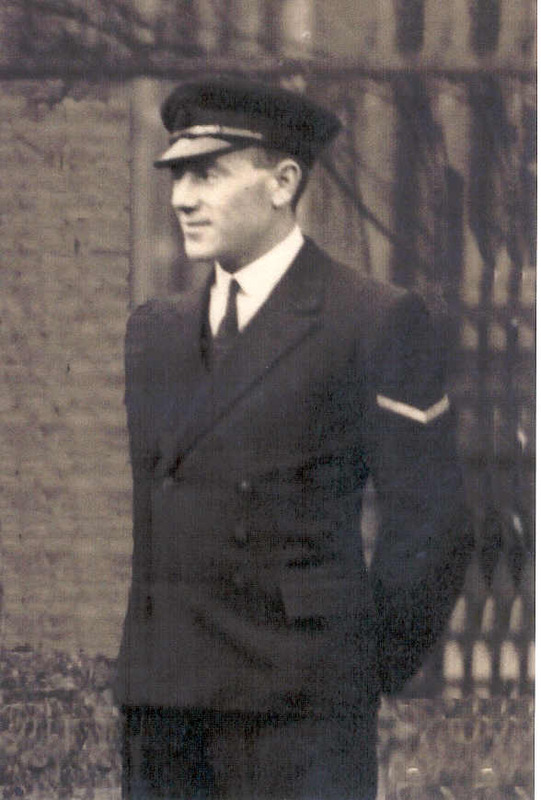 "ASPINALL, JACK, LEADING SICK BERTH ATTENDANT "
Son of Herbert and Alice May Aspinall, of Nottingham. Photograph supplied by his niece Christine Strong. It was taken on 26th March 1940 at his sister's wedding. Once more an air mail letter card to you. Almost every week since mid July I have sent you an air mail card on air-graph, so you should be kept up to date. When you receive this you will know that our enemy fortress in Libya has been bombarded. We took part both times, and apparently each operation was successful. The object was to do as much damage as possible to material and morale of the enemy. You may remember that Mussolini called it the Bastian of Fascism but it was captioned The Army of the Nile and a huge number of prisoners taken. It must have been very uncomfortable ashore whilst the bombardment lasted. We are now hitting back at the enemy in the only possible way. If the Russians can hold out, then the war may be soon over. Have not heard from Arthur yet, nor had any air-graphs from you or Ena since early in September. Last week a letter from you and one from Ena arrived, they were dated 29th July and were a few weeks late in arriving, for I had had the letter written the 1st week in August about 3 weeks previously. Despite our duty we keep very fit and are looking forward to our return home some time in the future. I hope you are all well and if Mary is having to do some war work that she likes it, and thus keeping the men provided with the sinews of war. Only one letter from Bill has arrived as yet. Apparently he does not write home very often, so I do not expect to get many from him. Remember me to all I know in Nottingham and all who enquire about me. I am very well and keeping fit. Now to close for this week, will be writing again to you very soon. All my love to you all and best wishes for the future. Once more an air mail to you. Ena will have told you a little of the latest developments, for I wrote her one air mail letter last week. We are only allowed to send one per week, and that is only to be one page. You will see it is free of change thus we now belong to the privileged few who get a free service like this. Well everything is O.K. with us, we are still moving about. The time passes quickly these days because there is always something happening. Early last week an ordinary letter from Ena arrived, it was sent early in September. We expect more mail to arrive very soon now. Then I will hear from you again. The Russians are now holding up the Nazis advance, and even throwing them back at certain points. They are certainly helping Britain in her war. Maybe they will win the war for us. I have not heard from Arthur for some time now. Three weeks ago was the last time and then he was expecting seeing me whilst on leave. I am sorry that we could not meet, but duty comes first. Not as though we have any option but to do our duty. At our new place fresh scenery for us to see, it is well known to the service of pre-war, but new to me. I have had two times ashore and have enjoyed each one. Soon it will be Christmas and then a New Year to follow. I hope you have now received my remittance sent on to you. I am often thinking of you all doing your various jobs at home, and often wish peace was with us and I was back at home amongst you. Tonight over the radio we heard that Nottingham had raised £2.75 Million towards a new cruiser. Good going that for the city. Will close now, wishing you all the best for the new year, and all my love to you all at home.